Brothers Arman and Artavard Karamyan, who led the league in scoring while leading Pyunic to its dominating title last season have joined Panahaiki Football Club. Arman Karamyan was named Player of the Year for the 2002 season after scoring 36 goals on the season, followed by his brother. The brothers signed deals with the Greek club on January 3. 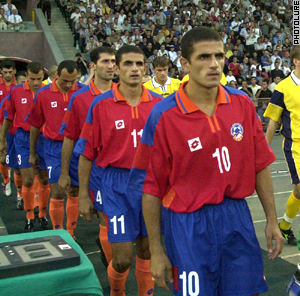 Meanwhile Pyunic is preparing to enter the Commonwealth of Independent States Cup 2003 where it will match its skills against best clubs from other former USSR republics. Representing Armenia, Pyunic will compete in Group B (there are four groups) and will face Skonto of Latvia when competition begins January 18. It will also be paired against BATE of Belarus and Regar-Tadaz of Tajikistan in the tournament which runs through January 26. After a short break ATP season 2003 has started. Sargis Sargsyan of Armenia has begun the season ranked No. 18. Sargsyan reached the quarterfinals of a tournament in Chennai, India that ended Monday (January 6), where he lost to Paradorn Srichaphan of Thailand 4-6, 4-6. Sargsyan reached the quarterfinals by defeating Julien Varlet of France (6-1, 7-5) and Albert Montanes of Spain (6-4, 6-3). Three Armenian figure skaters are preparing for the European Figure Skating Championships 2003 that will be taking place in Malmo, Sweden from January 20 to 26. At the competition Armenia is represented in two categories out of four. Aramais Grigoryan will be skating in the men's singles category meanwhile Anastasia Grebenkina and Vazgen Azroyan will be representing Armenia in ice dancing.